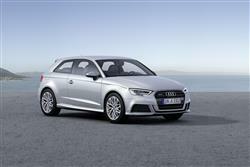 Find out everything you need to know on the new Audi A3 from independent vehicle review website Car And Driving. You can watch the video review to the left to see more of the car or read their written review below to get a true insight from an expert in the automotive industry. Exterior changes to the A3 are slight but the front looks a little more purposeful, courtesy of sharper lines for the familiar and now broader Singleframe grille. The headlights are flatter, with distinctive outer contours and can now be ordered in Matrix LED form, so they are significantly brighter and constantly adapt themselves to avoid dazzling other road users, plus of course they never need to be dipped. Equally subtle changes at the rear aim to accentuate the width of this car - with the horizontal illuminated graphics of the rear lights and the separation edge above the redesigned diffuser. Inside, the 'Virtual Cockpit' instrument display used in the TT and other pricier Audis is now available in this one as an option. This displays the most important driving-relevant information in high resolution on a 12.3-inch diagonal TFT screen. The driver can switch between two views by pressing the "View" button on the multifunction steering wheel. In addition, the menu structure that works the centre dash MMI infotainment screen has been redesigned and is now more intuitive. Otherwise, everything is pretty much as before, with classy materials and strong build quality. The hatch most will want with three or five doors has a 365-litre boot - and there's still the option of saloon or Cabriolet bodystyles if you want them. Pricing for the A3 1.5 TFSI starts at around the £22,500 for the three-door variant, with a £620 price premium to find if you want the extra versatility of the five-door Sportback. To put that into perspective for you, a comparably performing A3 2.0 TDI diesel three-door would cost you around £1,500 more and only take you around nine miles further on each gallon of more expensive black pump fuel. The key option with this improved model is the clever 'Virtual Cockpit' system replacing the conventional instrument dials with an eye-catching 12.3-inch TFT display. But of course, there's much else to select from. As for infotainment, well Audi reckons that this improved A3 sets fresh standards here. An 'MMI radio plus' set-up with an electrically extending 7-inch diagonal monitor is standard, while the 'MMI navigation' system is fitted from 'SE Technik' trim upwards. Go further and specify the 'MMI navigation plus with MMI touch in conjunction with the Audi connect' package (what a mouthful!) and you can have many online functions in your A3 at high speed via the super-fast LTE standard. They include, for example, navigation with Google Earth and Google Street View traffic information in real time, as well as practical information on parking, destinations, news or the weather. There's also a free 'Audi MMI connect' app that enables other services, such as online media streaming and transfer of a calendar from a smartphone to the MMI. Mobile phones with iOS and Android operating systems can now be connected with the car via the standard Audi smartphone interface.